My first job in Rome was in a restaurant owned by a Neapolitan man and his Roman wife. The best food in the place was undoubtedly that cooked by his mother; who would shuffle in bearing great trays of Melezane alla Parmigiana; heavy with eggplant that had been first fried (Neapolitans love to fry) before being layered with rich tomato sauce and mozzarella. Between being harangued by the owners and shuttling carafes of water out to customers, my favourite moment of every shift was cutting the bread ready for service. It was most often delivered still warm from the wood fired ovens of Forno La Renella, and standing over the cutting board of the old timber madia I would slice generous hunks off the strong crusty loaves, most probably lost in the bready aroma and thinking about what was on after the shift. 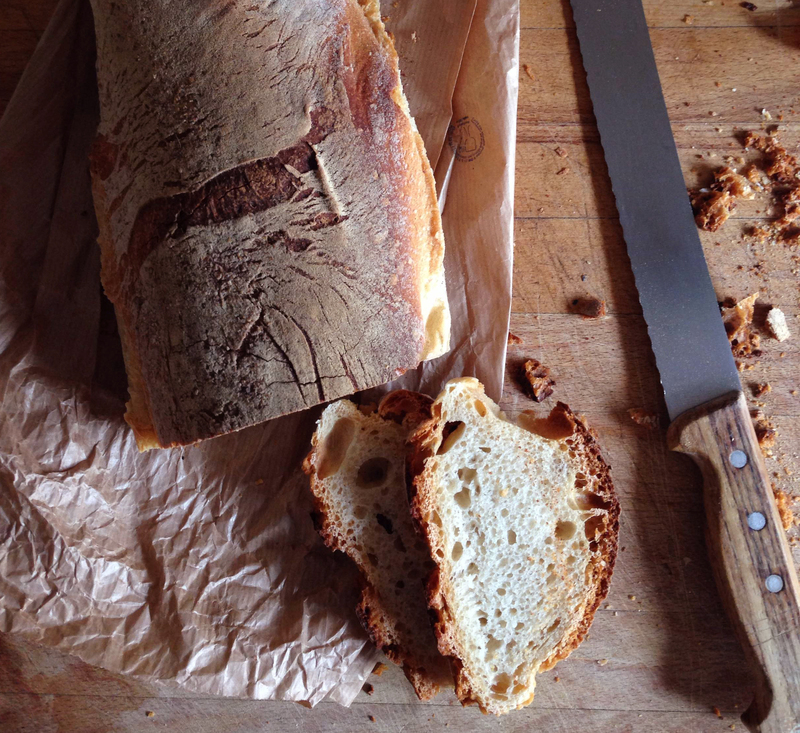 During my early years in Rome I spent plenty of time mopping up the juices of traditional Roman stews with the bread from La Renella, and sometimes when I am in Trastevere I detour for a filone, even though my favourite Roman bread is still the dark dense Pane Lariano. 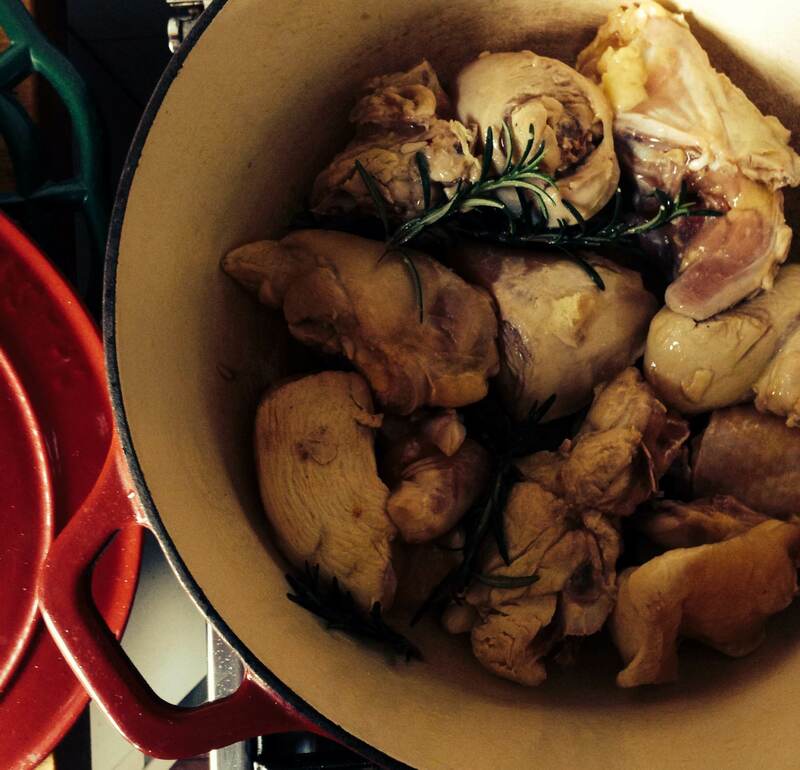 Pollo alla Romana, is, in its rather rough preparation, a very Roman dish. One of my favourite versions is that served at the perpetually crowded Da Augusto in Trastevere, where it’s plonked down on the table with the same sort of finesse with which it is made, that is – very little. Roman cooking could be called slapdash; meat is cut any which way, oil and wine are added ‘quanto basta’ – whatever seems enough, and herbs are tossed in whole. It’s food to embrace, to wipe up off the plate with a hunk of wood fired bread, to use your hands with, and most certainly to wash down with a good light red from the Castelli Romani. 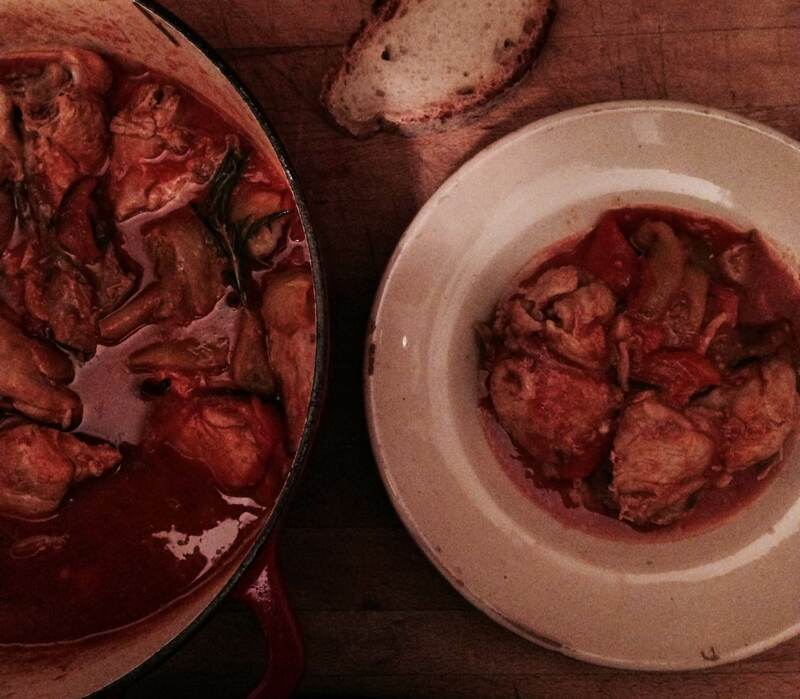 Pollo alla Romana is a sort of stew, the kind that requires bread for serious mopping. 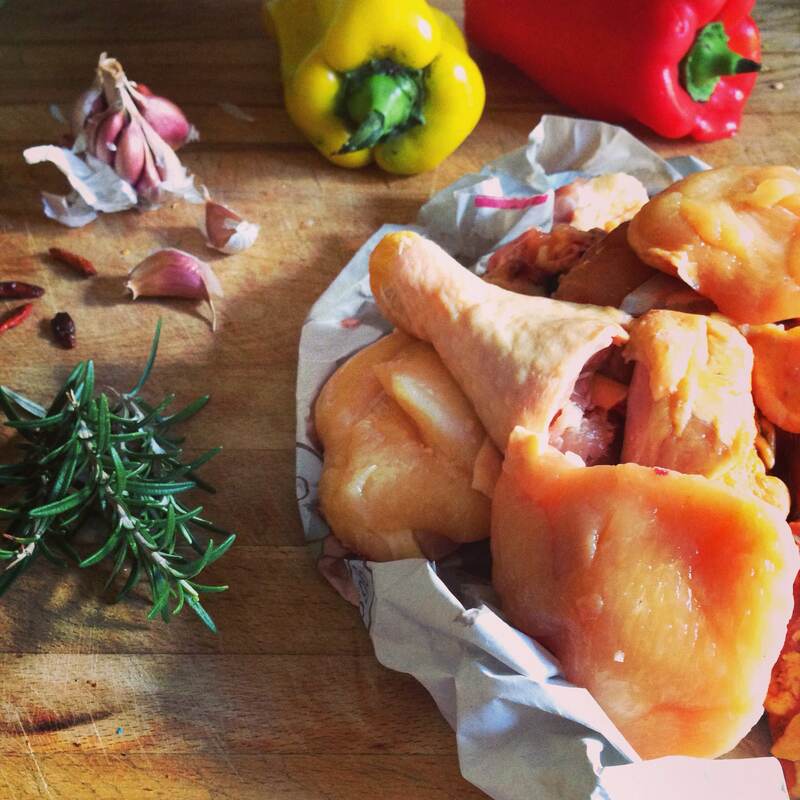 It can be called it Polla alla Cacciatora – hunter’s chicken – and is like a first cousin to Pollo ai Pepperoni which is sort of the same with the inclusion of roasted red and yellow peppers. Some cook it with quite a lot of tomato passata, others with more like a hint of tomato in the form of a couple of ripe chopped tomatoes. Heat olive oil in a large heavy based frypan or casserole dish. Add chilli broken into pieces and then a sprig or two of fresh rosemary.Sprinkle chicken pieces with salt and pepper and when the oil is hot add them to the pan, browning well on all sides. Add the garlic (peeled and squashed), stir everything well and cook for about 5 minutes.Add the wine to deglaze the pan and capture the flavors, then tip in the crushed tomatoes and half a can of water and cover. Cook at a simmer for half an hour. Add more tomato or water if you want to lengthen the sauce a little. Season to taste.Serve with patate al forno and good bread. Nothing beats the way you and Bob roast pheasant Lizzie, especially with that devils food underneath!